If a referendum on joining the EU had been held in February 2017, there would have been 64% of votes for joining the EU, and 36% - against. In a referendum on NATO membership, there would have been the following results: 57% - for Ukraine's accession to NATO, 43% - against. Asked about the desired direction of foreign policy, 47% of respondents voted in favor of Ukraine joining the EU, 14% continue to support accession to the Customs Union of Russia, Belarus, Kazakhstan, Kyrgyzstan and Armenia, and 28% believe that Ukraine should develop independently without signing in none of these associations. In a period of February 10-19 of 2017, Kyiv International Institute of Sociology (KIIS) has conducted its own public opinion poll. Data were collected from 2040 respondents living in 110 settlements (PSU) in all regions of Ukraine (except for AR of Crimea and temporarily occupied parts of Donetsk and Luhansk oblasts) with the method of personal interviewing. The sample was stochastic and is representative of the population of Ukraine aged 18 and above. In Luhansk and Donetsk oblasts (regions) survey was conducted only in the territories that are controlled by the Ukrainian government. In this survey, the sample covered only the controlled part of Donbas in the same proportion as it was registered for Donbas voters in the last parliamentary elections (October 2014) according to the data of CEC. The attitude of citizens of Ukraine to the question of Ukraine's accession to the EU remains unchanged over the last year: as a year ago, about half the population of Ukraine was ready to vote for the accession of Ukraine to the EU in February 2017. 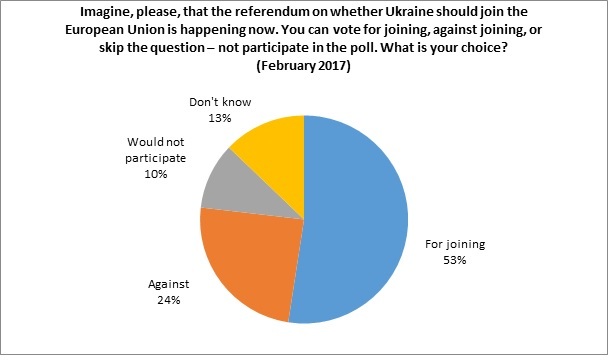 According to the survey, if a referendum on whether Ukraine should join the European Union had been held in February 2017, 49% of residents of Ukraine would have voted for Ukraine's accession to the EU, 28% - against, and the remaining 23% are undecided or would not have voted. If those who had not decided how to vote yet, had not, as usual, come to a referendum on EU accession, about 77% of all who have the right to vote, resident in the unoccupied territory would have voted, and the votes would have distributed as follows (actually, these indicators are the closest to the possible results of the referendum, if it had been held in February 2017): 64% - for joining the EU, 36% - against. Residents of Ukraine without temporarily occupied territories (excluding Crimea and parts of Donetsk and Lugansk regions). The data are for Ukraine, except for the temporarily occupied territories (excluding the AR of Crimea and parts of Donetsk and Lugansk oblasts). The readiness of the residents of Ukraine to vote for joining the European Union remains stable over the time passed since the annexation of Crimea and the start of the war in the East of Ukraine: despite some waves, the number of those who are ready to vote for Ukraine`s accession to the European Union remains about 50%. As it was before, the attitude to the question of Ukraine`s accession to the EU differs significantly from region to region: the most support is observed in the Western region (75% are ready to vote for accession), the least support – in the Eastern region (16% - for accession). In the Central region 49% are ready to vote for Ukraine`s accession to the EU, and 37% in the South region. In addition to questions about what to do in case of a referendum on joining the EU, respondents were asked which direction of foreign policy they considered to be more desirable for Ukraine. 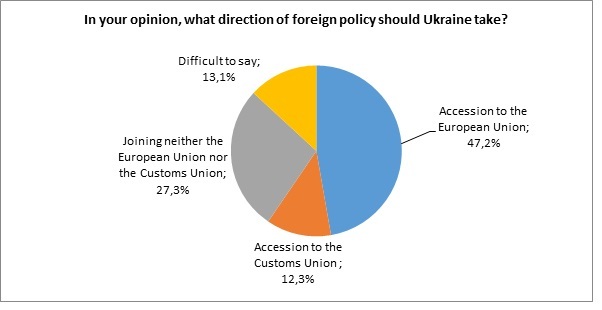 According to the survey, Ukraine's accession to the EU remains to be the preferred direction of foreign policy (47%). The course to join the Customs Union of Russia, Belarus, Kazakhstan, Kyrgyzstan and Armenia is preferred by 14% of the residents of Ukraine. A significant portion (28%) are still set against the EU and the Customs Union and considers that Ukraine should develop independently without going to any of these associations. *Westernregion: Volynska, Zakarpatska, Ivano-Frankivska, Lvivska, Rivnenska, Ternopilska, Khmelnytska, Chernivets`ka oblasts; Centralregion: Kyiv city, Kyivs`ka, Vinnytska, Zhytomyrska, Kirovohradska, Poltavska, Sumska, Cherkaska, Chernihivska oblasts; Southregion: Dnipropetrovska, Zaporizka, Mykolaivska, Odeska, Khersonska oblasts; Easternregion: Kharkivska oblast, only regions controlled by Ukraine in Donetska and Luhanska oblasts. The opinions of the population on the desired course of foreign policy remain almost unchanged over the past two years. In the Eastern region, the most preferred courses are not joining any of the unions (37%) and joining the Customs Union (35%); a course for the EU is supported by only 14% of the inhabitants of the region. As in previous studies, the current share of supporters of Ukraine's joining NATO dominates the share of opponents: if a referendum on the question of whether Ukraine should join NATO had been held in February 2017, 41% of residents of Ukraine would have voted for Ukraine's accession to NATO, 32 % - against; the remaining 27% were undecided or would not have participated in such a referendum. 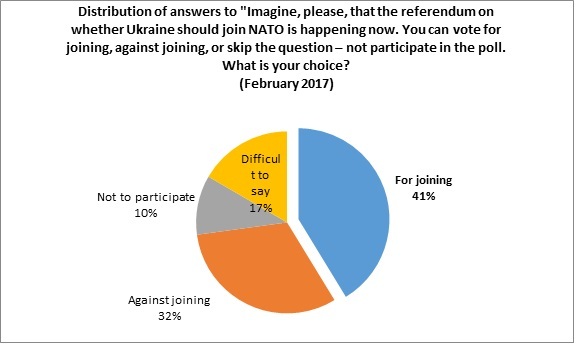 Thus, if the referendum on Ukraine's accession to NATO had been held in February 2017, and all those who had decided on their choice had come to vote, the turnout would have amounted to about 73%, and the voices of the participants would have distributed in the following way: 57% - for joining Ukraine NATO, 43% - against. The share of those ready to vote for Ukraine's accession to NATO has not changed over the past two years: 40% - in May 2015, 39% - in September 2016 and 41% - in February 2017. In the Eastern region, 15% - for NATO, 54% - against, 32% - are undecided. Westernregion: Volynska, Zakarpatska, Ivano-Frankivska, Lvivska, Rivnenska, Ternopilska, Khmelnytska, Chernivets`ka oblasts; Centralregion: Kyiv city, Kyivs`ka, Vinnytska, Zhytomyrska, Kirovohradska, Poltavska, Sumska, Cherkaska, Chernihivska oblasts; Southregion: Dnipropetrovska, Zaporizka, Mykolaivska, Odeska, Khersonska oblasts; Easternregion: Kharkivska oblast, only regions controlled by Ukraine in Donetska and Luhanska oblasts.